DUSSELDORF, Germany, Dec. 21, 2016 /PRNewswire/ -- trivago N.V., a global hotel search platform (NASDAQ: TRVG) (the Company), today announced the closing of its initial public offering of American depositary shares (ADSs) representing Class A shares at $11.00 per ADS and the exercise in full of the underwriters' option to purchase additional ADSs. The Company sold 20,826,606 ADSs in the offering and certain shareholders of the Company sold 9,200,029 ADSs in the offering, including 2,716,515 ADSs offered and sold by the Company and 1,200,002 ADSs offered and sold by the selling shareholders pursuant to the exercise in full of the underwriters' option to purchase additional ADSs. trivago estimates its net proceeds from the offering to be approximately $212 million after deducting underwriting discounts and commissions and estimated offering expenses. J.P. Morgan Securities LLC, Goldman, Sachs & Co. and Morgan Stanley & Co. LLC acted as lead book-running managers. Allen & Company LLC, BofA Merrill Lynch, Citigroup Global Markets, Inc. and Deutsche Bank Securities Inc. acted as bookrunners and Cowen and Company, LLC and Guggenheim Securities, LLC acted as co-managers. The offering was made only by means of a prospectus. Copies of the prospectus relating to these securities may be obtained from J.P. Morgan Securities LLC, c/o Broadridge Financial Solutions, 1155 Long Island Avenue, Edgewood, NY 11717, Attn: Prospectus Department, or by calling 866-803-9204; Goldman, Sachs & Co., Attn: Prospectus Department, 200 West Street, New York, NY 10282, by telephone: 1-866-471-2526, or by e-mail at prospectus-ny@ny.email.gs.com; or Morgan Stanley & Co. LLC, Attention: Prospectus Department, 180 Varick Street, 2nd Floor, New York, NY 10014, by telephone (866) 718-1649, or by email at prospectus@morganstanley.com. A registration statement relating to these securities has been declared effective by the U.S. Securities and Exchange Commission (SEC). This press release shall not constitute an offer to sell or the solicitation of an offer to buy, nor shall there be any sale of these securities in any state or jurisdiction in which such offer, solicitation or sale would be unlawful prior to registration or qualification under the securities laws of any such state or jurisdiction. Founded in 2005 and headquartered in Dusseldorf, Germany, trivago is a global hotel search platform focused on reshaping the way travelers search for and compare hotels. trivago's mission is to "be the traveler's first and independent source of information for finding the ideal hotel at the lowest rate." As of September 30, 2016, trivago's global hotel search platform offered access to approximately 1.3 million hotels in over 190 countries. 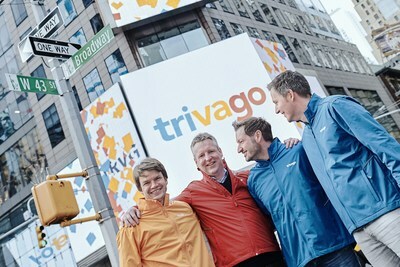 trivago's platform can be accessed globally via 55 localized websites and apps in 33 languages. This press release contains a number of forward-looking statements. Words, and variations of words such as "believe," "expect," "plan," "continue," "will," "should," and similar expressions are intended to identify our forward-looking statements. These forward-looking statements involve risks and uncertainties, many of which are beyond our control, and important factors that could cause actual results to differ materially from those in the forward-looking statements. For additional information factors that could affect our forward-looking statements, see our risk factors, as they may be amended from time to time, set forth in our registration statement on Form F-1, as amended from time to time. We disclaim and do not undertake any obligation to update or revise any forward-looking statement in this press release, except as required by applicable law or regulation.